Perhaps I'm in the minority who find this to be an issue, but the blinking octave lights are a terrible design decision. Lights blinking/pulsing based on tempo, LFO speed, etc. are a logical design decision, as they tell you something meaningful. A light/button blinking constantly to indicate a static state is a pretty basic UI design failure. 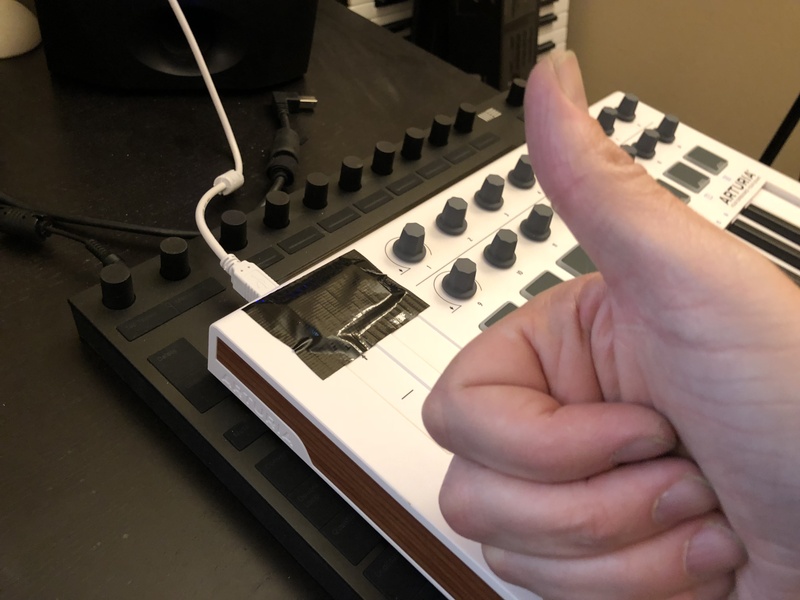 The designers could have indicated octave in many ways, such as LED brightness, color (I have a Korg MIDI controller from -2005- that does this), or even a momentary blink – or no indication at all, given that playing a note will tell you what octave you're in. I'm simply baffled that the chosen solution was an always-blinking LED button telling me "Yep, I'm still in this octave! I just wanted to get your attention to let you know nothing has changed!" I don't know if anyone from Arturia reads this forum, but seriously guys, fix this. I agree it is a terrible design idea. Someone said it blinks faster as the octaves go up. How about this: you listen to what you’re playing rather than watching how fast it blinks! Seriously Arturia, you can turn this off in a firmware update. Give us the option to disable the flashing, like every other keyboard controller on the planet. I agree, the blinking octave lights are a terrible design decision and very annoying. Just bought the MiniLab MKII. It was the first thing I noticed about it right after I turned it on and have been looking for solutions since. Shame, as it ruins the experience with what seems otherwise like a good design. It requires a software fix badly. I have transmitted your request to the development team. I don't know what will be done here but this is now logged to our database. I've owned the Minilab MKII for five minutes and it's the first thing I tried shutting off. If this doesn't get rectified I'm tossing it into the bin! I hope there's a firmware update for this soon. I got the Minilab MKII for Christmas and I want to join the critick! The flashing octave LED makes me crazy! I have already updated to the latest firmware in the hope there would be an option added. Is it worth it to unscrew the Minilab to see if I can simply disconnect the LED? (I know that I will lose the guarantee). On such tiny keyboard this was an oversight on Arturia's part. It's hugely distracting and the first thing that jumped out (and continues to). Hopefully it'll be addressed in a firmware revision but for now it'll just be annoying. Lovely little thing, too. Seems decently built. Although it does have a chassis tone that isn't great. It wasn't an oversight though, it was a deliberate design decision. Some of the responses here are comical. I really can't take people seriously who are so melodramatic that they threaten to throw away a $100 controller just because the LEDs flash. Simplest solution is to just put some sticky tape over the buttons. Problem sorted. Worst solo ever. I'll keep it. I'm not sure which is more annoying: The blinking lights on the octave buttons, which is distracting, or the ridiculous amount of "security" fields I have to fill out just to post on this forum(why do I have to answer trivia questions to make a post?). honestly, i came here with the purpose of posting something in favor about the mkII, but after losing 10 minutes of my life with that thing i will just leave the forum forever.